The Minox Suntimer Monitors Sun's Rays, For When You Apparently Can't | OhGizmo! There’s probably no better time to be talking about the sun’s harmful effects than when there’s barely any of it. It’s winter. But hey, why not? The Minox Suntimer is a watch-sized device meant to be strapped to a sun-exposed part of your body. 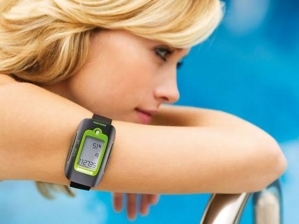 It monitors your skin’s exposure to UV rays and tells you when you’ve been fried enough. We imagine that feeling your skin burn is probably not clear enough a signal for some, and a gadget like this could be warranted. To determine an optimum time to stay in the sun, important individual factors can be programmed into this tiny instrument, such as skin type and the protection factor of sunscreen in use. In this way, the user gets a maximum time reading which is individually adjusted to his or her personal profile, and when that time expires the Suntimer? sounds an alarm to suggest you get out of the sun. Pricing and availability are not clear at this point. Hmm, why not just move the device slightly to the left and look at the difference between the formerly-sun-shielded part and the exposed part. These are smart people. I guess it might turn out to be a status symbol to have a $$ device that tells you something a three cent wristband could have.